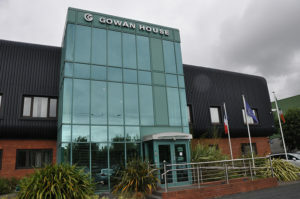 The Gowan Group has active Property and Investment Divisions. The investment in Property is in line with the Group’s policy of re-investing its profits back into expanding the Group’s companies to their maximum potential. The distribution centre for Peugeot on a 2.5 acre freehold site. Navan Road, Dublin 15. Acquired in 2007, this 2.6 acre site underwent a major refurbishment and is now one of the most prestigous showrooms and aftersales garages in the Country. 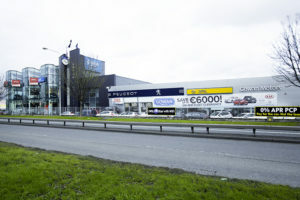 Peugeot, Honda, Opel and KIA vehicles are represented at Gowan Motors Navan Road. 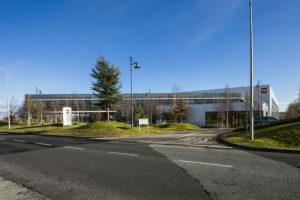 Home to the KAL Group of companies, this state of the art, purpose built premises in Citywest Business Campus was completed in late 2004. The 80,000 sq. ft headquarters incorporates 10,000 sq. ft of offices, 10,000 sq. ft of state-of-the showrooms and 60,000 sq ft of warehousing space. 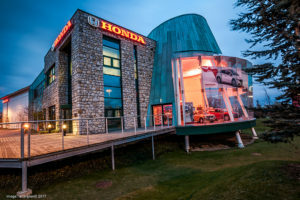 Universal Honda’s landmark corporate headquarters at Citywest on the Naas Rd, were officially opened on 3rd May 2006.The stunning contemporary building, on it’s 5,098 sq mt site, reflects Honda’s committment to the development of the brand in Ireland. The building itself is architecturally innovative, sporting a suspended, circular glazed showroom which can be seen from the N7 at the Browns Barn interchange. The Group also has an exposure to the UK property market through a shareholding in a partnership with a large UK property portfolio.